Our range of snooker tables are perfect for home or commercial use. They come with free delivery and a free accessory pack to get you started. Finance available. 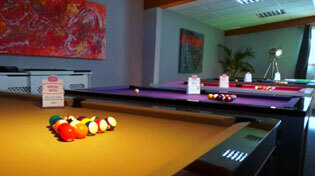 We have a fantastic selection of new snooker tables for home and commercial use. They are all high quality tables available in a range of styles, sizes and finishes from two main manufacturers; SAM and Sovereign. SAM are well known for their quality games room and leisure products and make tournament quality snooker tables here in the UK. Their tables are made from the very best materials and are finished to the highest standard are available in 10ft or 12ft and a variety of finishes and cloth colours. These tables are a real luxury product, they play, feel and look fantastic and are a great investment as these sturdy tables are really made to last and be cherished and played by all. The Sovereign range of snooker tables are a more affordable alternative to a tournament level table. They are of commercial standard and use sturdy hardwood, slate beds and 100% pure wool. They come in a range of sizes; 8ft, 9ft, 10ft and 12ft (full size). Snooker tables really are large in the flesh, so the smaller sizes are perfect if you are pushed for space, but still want the full enjoyment of playing snooker in your own home. We have a range of traditional and modern looking snooker tables, a traditional snooker table is finished in mahogany with a green cloth, but you can pick from a range of styles, finishes and cloths. Since the snooker World Championships used silver finishes on their tables such as the Riley Aristocrat Tournament and the Star Snooker Tables, a popular choice has been the SAM Tagora in a silver finish. These look really great when combined with a bright cloth such as a purple or red. Here at Home Leisure Direct we have chosen to specialise in luxury slate bed snooker tables, as we have learned in the past that it is really not worth selling cheap, MDF snooker tables as they are such poor quality and don’t last long. All of our snooker tables come with free delivery and installation and a free pack of accessories to get you started as soon as your table is fitted. Specialist installation is essential for a product of this nature, which is why we provide this free service. Our expert team of engineers are highly trained and have been fitting snooker tables for many years. If your intended location is up or down stairs please contact us to discuss the route and it’s measurements so we can provide you with a quote for any additional costs.